Lion Guardian Olubi spent the whole of the day yesterday and most of the evening looking for six lost animals – three calves and their mothers. 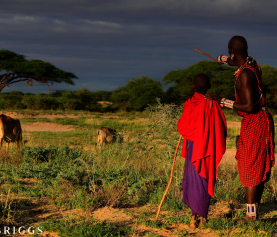 The livestock belonged to one of his neighbors, who left them outside the boma in the bush overnight. Here is Olubi looking for tracks. 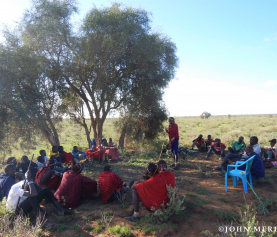 UnfortunatelyÂ for the owner of the livestock, this lead to the calves being killed and their mothers being injured by hyenas. This illustrates very well the reason the Lion Guardians advise all herders to bring their animals into bomas overnight, like the ones below.Â Calves especially are easy prey for a hyena. The owner was extremely unhappy about this incident, but he has no one to blame but himself and his herder, since it was him that left them out overnight. 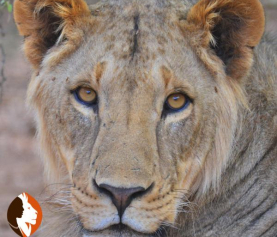 I would like to thank blog readers for their recent donations – Hashi, Kit, Sporting T, Jessica, Pirjo, Ellen, Kim, Loki, Peter and Alison have all donated to the Lion Guardians in July. Thank you! We would also like to send our special thanks to Jia and Richard for their sponsorship of Lion Guardians. If anyone feels they would like to donate a smaller monthly amount and join another reader or two to sponsor a Guardian please get in touch below! Wow…people need to take your advice and put their animals up at night! What a job you have………….I do want to donate..going in with someone else may be an idea!